Bryan got to hold Hudson before he headed to surgery. The two of them had "church" together as Bryan read him scriptures and sang hymns with Hudson. The surgery was scheduled for 1:00PM but for whatever reason it was delayed by 30 minutes. Pastor Toby and two of Bryan's co-workers came and hung out with us in the waiting room during that time. After the surgery Hudson was taken right back to his room. His catheter was definitely in him and it sticks out of him about a foot. The surgeon and nephrologist (kidney Dr.) both agreed it would be ok to start Hudson on dialysis that night. We hung out awhile after his surgery but then things started moving to get him started on dialysis and he was pretty sedated from the surgery so we headed home to have dinner with the girls. 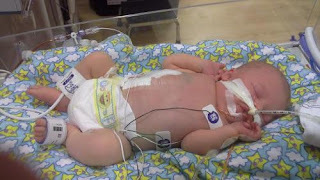 Hudson after 12 hours of dialysis....his belly looks smaller! 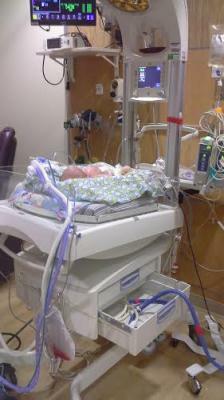 When we came in the next day wow was it different seeing him all hooked up for dialysis. He is getting 30 mL every hour. Gravity drips 30 mL of the dialysis solution into Hudson, it sits there for 1 hour then they drain it out, and repeat. More than 30 mL should be coming out than going in and so far it appears to be working. Hudson's belly and swelling looks so much smaller today. With all the drainage he has lost 170 grams of fluid weight. He looks so good today. We got a good report for the NICU team. They took an x-ray of his intestines and said they look really good. So good they will be starting him on 7 mL of breastmilk to slowly start introducing eating to him. All his numbers seemed to go down slightly in just the 12 hours of dialysis. With all the reduction in swelling there is a leak in his breathing tube which is ok as it is now forcing him to breath more on his own. 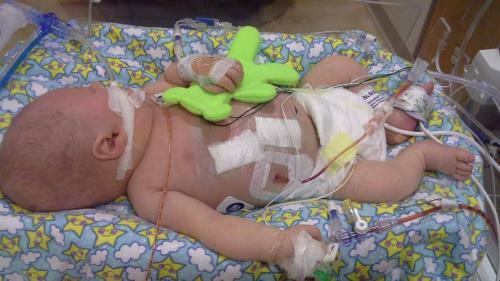 The nurses mentioned by this weekend they think the breathing tube might be able to come out! So much is starting to move now, dialysis, introducing eating, and getting him to breath on his own. They move fast. All the nurses are anxious to get Hudson home as much as we are. Hudson will be here awhile in the NICU then he will eventually get transferred to the kidney floor where he will work his way up to getting dialysis less and less. The goal is for him to only need dialysis at night. Bryan and I will eventually go through extensive training on how to care for Hudson at home. But it should be we just hook him up to do dialysis at night, the machine runs 8-10 hours, and we unplug it in the morning. Hudson should be good to go during the day. The tall pole contains the bag of dialysate. Hudson is officially off the dopamine (blood pressure medicine) and we are hoping soon he will be off of the phenobarbital (seizure medicine). The phenobarb makes him kind of drowsy and this momma would sure love to see Hudson moving around even more than the little he already does. Today he opened both his eyes and looked at mommy for about 20 seconds. It melted my heart for sure and brought me such joy. But for the most part he is quite a sleepy baby. 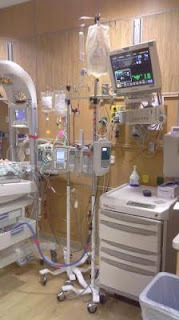 Right now he is connected to these fluids: dialysis, an IV, TPN (food), and the phenobarb drug. Now he has two catheters (one to pee and one for dialysis), the breathing tube, a blood pressure cough, a sticker thermometer, and couple other stickers on his chest to monitor his heart rate. This momma can't wait to see him slowly weened off of most of these and reduce some of the lines surrounding him. But gosh are we ever so thankful for modern medicine and to live in a country that thinks highly of it. It felt good to walk in and hear and see such good news today. The Lord is good.